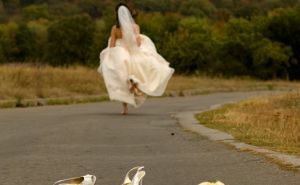 Almost a Runaway Bride | Just Me With . . .
As the wedding consultant opened the double doors, my dad said,”You don’t have to do this. We can walk right out.” It kind of broke my heart a little. He didn’t care about the money or the people; he wanted me to be happy. I had my doubts in the days leading up to the wedding, but I have not regretted getting married. Yet. Do you think all brides consider running, or is it a really bad sign? The day before the wedding they were in the bathroom together, sniping loudly at each other. She was nasty, bitter and demanding. He was irritated and infantilized. Two things suddenly became clear to me: They hated each other, and I hated their marriage. I came out to the kitchen, pale and shaking and told my mother that I didn’t want to get married. I told my husband-to-be about the incident. He made excuses for his parents. That should have been my last red flag. That all by itself should have been the thing that moved ME from the “corner of the church” out the door. I thought I was so smart because I was 25. I’d had my first proposal at 14. I’d waited until I was “old enough.” What I didn’t know, was that the goal was really not to “do the right thing,” but rather to do the true thing. I also didn’t know that I was still dumb as a box of rocks and completely negating my own spirit and discernment in favor of those around me. I went ahead and married him. I’m with you, Just With… If someone had given me external permission to listen to that voice inside that said “You don’t have to do this…” I would be living a very different life right now. Hopefully one that didn’t include legal fees, divorce papers and stress over custody issues and single parenting. The thing that scares me though, is that I honestly believed I knew what I was doing. I am pig-headed by nature and once I think I know the answer to something I’m really hard to shake. I’ve gotten better with that over the years, but back then, there were no gray areas. So my question for you or anyone else who cares to answer is: Is there any way to help our children learn from our cautionary tales when they are young, determined and dumb as a box of rocks? Or do they just have to make their own mistakes? Can’t we help at least take the edge off of some of the messes for them? You know, sort of like cutting the bitter crusts off of their toddler sammiches? I’ve told her that if she ever married a man who did not pay attention to her, cherish her, or engage her in the kinds of deep connections she loves, I’d kill her before her marriage could. I’m thinking that wasn’t the most successful or wise strategy. Anyone got any insight here? Wow. We do live in a parallel universe. Since my intended and I had been dating since teen years I too thought I’d waited until a respectable age. My parents weren’t thrilled about the wedding and we were barely talking so there was a bit of “I told you so” avoidance. I do think there are things to do to help our children minimize mistakes. I don’t know if they will work — I use song lyrics, movies, etc and the bus theory — that men/boys/(or girls) are like buses, if you wait long enough another one will be around shortly. I’ll try to keep talking about things they can do –achieve experience– . A cancelled wedding is preferable to a divorce every time. No contest. Like I said having somebody to talk to is key–there’s a difference between nerves and true doubt– and “what’s love got to do with it”? Nothing. PS — My now-ex husband did everything he could to unconsciously force our marriage into a form that he recognized — the mold of his parents’ marriage. I resisted, even as I began to understand WHY his mother was so bitter and nasty. My choice became to be like her or to leave. I got smart and started trusting my own voice. I left. I remember the pull of not wanting to hurt people by backing out of the wedding. I can’t speak for you, but for me? That pain would have been preferable to all we’ve been through in the last 18 years. Is it just weddings? Should we all be there for our friends to ask them questions they need us to? To support during times of life-altering change – no matter what that is or what decision we come to? When, sometimes with our lives on the line, the right answer is “no”? I LOVE this post…and you have convinced me to watch SATC with all the references in you posts and tweets. This post makes me sad. I have wondered the same thing about my wedding day. Actually one of my uncles did tell me I didn’t have to, but it was in one ear and out of the other. He wasn’t the one who mattered. My other uncle that told me I HAD to get married was the one who mattered. Still, I was stubborn and determined to be the ‘good girl’ so I’m pretty sure I would have done it anyway. I only wish that while I was married and so obviously struggling I would have had some support from my family. Ten years later when I filed for divorce my other uncle (he raised me) tells me he never liked my husband anyway. Why did you say I had to marry him then?! I wish someone would have stood up and told me they would help me. Help me get out, get a job, a drivers license, a vehicle…anything. It pains me to think about how little support I had. I could never see my own daughter in a situation like that and not do all I could to help her. Later while going through my divorce people in our town would barely even speak to me. The reason- “I still have to live in this town.” See my husband’s parents were political figures in the town and I was the outsider in spite of living there for eight years. My husband could do whatever he wanted (i.e. breaking into the house, harassing me, etc.) and no one would ask me if I was OK or offer any help. If they saw him or any member of his family come around they would get away from me as quickly as possible so they would not be seen speaking to me. I lost a lot of respect for people. It boils down to people having a spine and standing up for what is right. Unfortunately those people are few and far between. I’m not trying to say your friends were spineless, I know you were all young and the thought of helping you bail out of your wedding was probably incomprehensible to them. I am only saying that in my case some sympathy or support from my neighbors and supposed friends would have been nice. Yes, that support would have been nice. I ended up getting that support when he finally left me, but I do wonder how it would have been earlier. My Ex has no political power. Your situation sounds so hard. People were just weirdly afraid of my Ex and are very polite to him. My own mother says she’s always been afraid of him. Of course when I was young and brainwashed I was offended by that, since my Ex never laid a hand on me. In my mind, at the time, absent physical abuse anything else was okay and he was being maligned. And, having not dated before I never really knew how things were supposed to be. But on my wedding day, or the day before, something got to me and I was almost ready to run. It’s true, though, that’s a very hard thing to do. I probably would have gone through with it anyway. But if my friends or family had said, “Look, you don’t have to do this, but if you do and something feels wrong, call me.” I think I would have remembered that, over the years. I pledge to pay it forward, though. If any bride I know seems reluctant, I’ll let her know somehow that she can opt out or at the very least, slow down. My sister tried to talk me out of it all the up to the point where she was walking down the aisle before me. She was in tears.